25261 scurries about Birmingham New Street station on July 31st 1976. The fifteen year career of D7611/25261 began with almost eighteen months on the Scottish Region before transferring to the London Midland Region for the remainder of its career. Tablet catcher recesses fitted (never removed). Carried two-tone green livery with TOPS numbers (April 1974 until March 1975). Time between last Classified repair and withdrawal: 68 months. Time between withdrawal & scrapping: 59 months. September 1967 to London Midland, Midland Lines (LMML). September 1968 to Birmingham Division (D02). January 4th 1981 withdrawn from Bescot. 25261 was the 85th Class 25 to be withdrawn, one of two retired during January 1981. 25261 was stored at Tyseley from January 1981 until March 4th 1982 when it moved as the 9L69 10.00am Tyseley - Bescot (attaching 25272) to Derby Works. 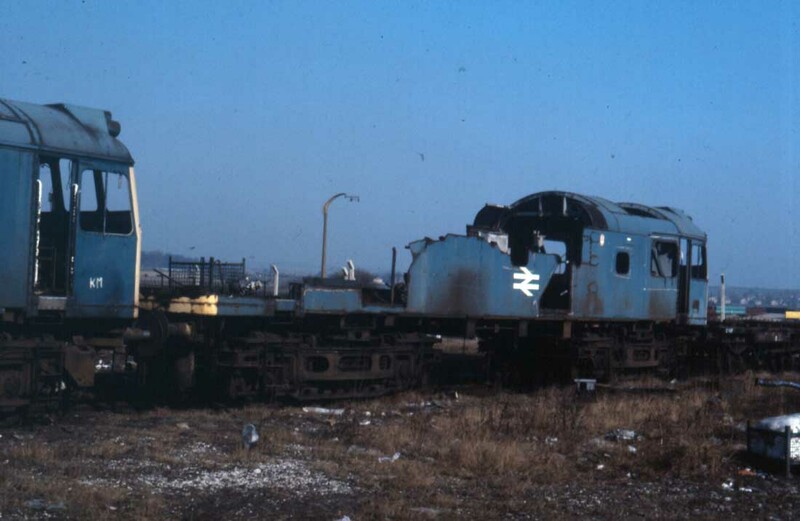 During April 1983 it was next in line for cutting up, which was started but a dispute in May 1983 saw the end of all cutting up at Derby, leaving 25261 partially dismantled! During November 1985 Vic Berry were called in to finish off the job which was quickly completed by month end. Noted Crewe Works December 1969. (Due a Classified Repair about December 1978 or December 1979, but never received). Its literally the end of the line for 25261 at Derby Works on February 26th 1985. Earlier that month, on February 4th & 5th two large convoys of scrap 25's had left for Swindon Works. The handful still remaining at Derby would move to Swindon on July 23rd 1985, but left behind would be 25261, no doubt considered unfit to make any lengthy move. During November Vic Berry would make a visit to Derby Works and complete the job originally started in June 1983! 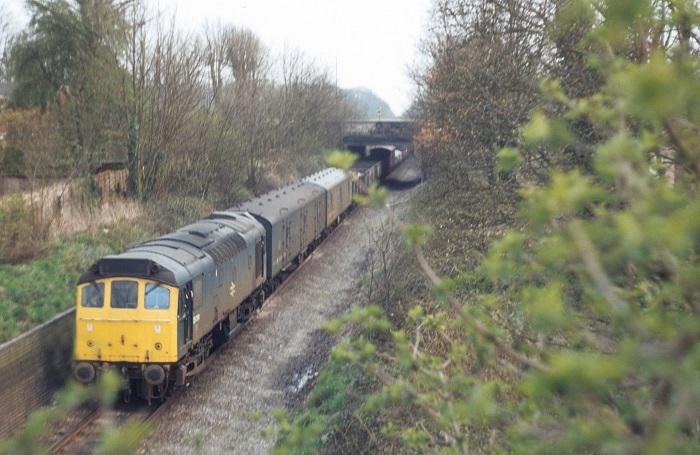 The thirteen Class 25s delivered to Eastfield from new, with D7611 being the first of this batch, were all built with a tablet catcher recess under the driver's side window. No other Class 25s received this feature. Although many of this group would later have the recess sheeted over, 25261 never did. 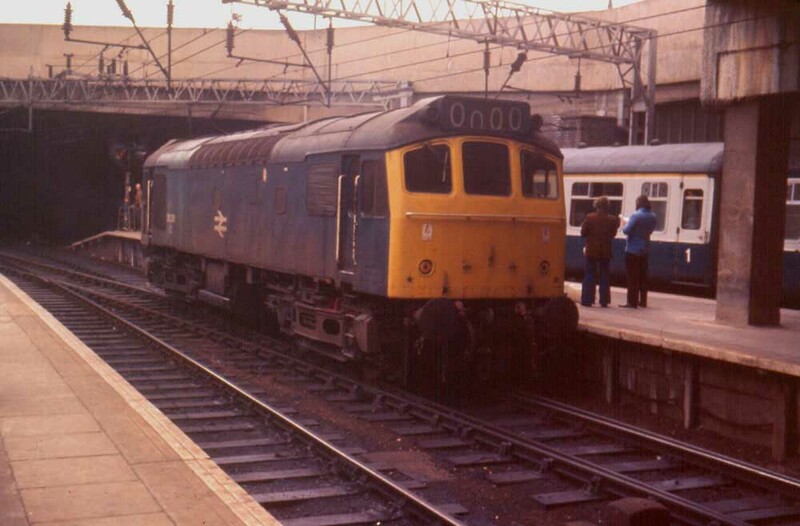 D7611 was from the only batch of Class 25s delivered with a cabside recess to accommodate tablet catcher equipment. D7611 was noted at Eastfield by April 29th. Although based at Eastfield these Type 2s spent much of their time in South West Scotland alongside the BRCW Type 2s quickly sending many Ayr & Hurlford’s Crabs, Black Fives & BR Standards to the storage lines and additionally helped Dumfries lose its steam allocation effective April 30th. At the end of May Ayr placed seven steam locomotives into storage because of the Type 2s arrival. Additionally at this time, with the arrival of these Type 2s, the return of some re-engined NBL Type 2s to service and the tranfer of more Claytons to Haymarket, the ScR were able to put the first of the Class 26s through Works for the fitting of slow speed control equipment & dual braking for use on merry-go-round workings. On June 17th the 21.25 Glasgow Central - St. Pancras was noted arriving at Carlisle with D7611 dragging a failed Class 45, Britannia No.70001 took the train forward. On July 2nd a Newcastle - Stranraer passenger service was noted west of Carlisle with D7611 piloting Black Five No.44986. On July 14th the 13.30 Stranraer Harbour - Newcastle was worked by 7611 & 5051, the next day (15th) the same locomotives worked the Newcastle - Stranraer Harbour (possibly the order is reversed in this observation). Photograph courtesy Roger Geach collection. 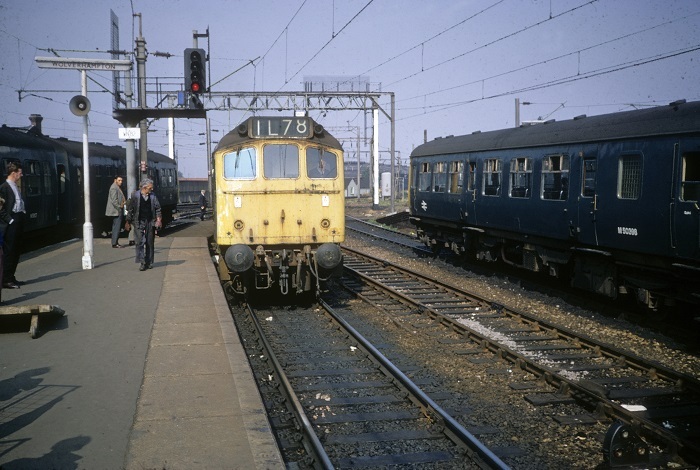 A Euston - Llandridnod Wells excursion exchanges locomotives at Wolverhampton with two Class 25s, led by 7611 dropping down on to the train, September 2nd 1972. On July 15th the return leg of a Southend - Wellington day excursion was worked by 7611 & 5133 between Nuneaton & Wellington. The Walsall - Norwich (for Yarmouth) - Norwich - Derby diagram was worked by 25261 & 25143 on August 24th. Condition August: two-tone green livery with full yellow ends, three-rung bogie mounted footsteps, straight sided sandboxes, numbers carried at 'wrong' end (on 2nd man's cabside). When repainted by Crewe during the spring of 1975 the numbers were placed on the bodyside. On August 30th a Lichfield City - Pwllheli day excursion was worked throughout by 25261 & 25263. On July 31st a return Bangor - Birmingham New Street day excursion was worked by 25261. The 01.45 Cardiff - Peterborough parcels on September 2nd was noted arriving at its destination behind 20140 + 20173 and failed 25261. A Bewdley - Paignton charter on May 6th was worked by 25261 & 25187 roundtrip between Bewdley & Kidderminster. The 10.40 Euston - Aberystwyth from Wolverhampton and the 16.10 Aberystwyth - Shrewsbury were worked by 25261 & 25147 on July 8th. On July 26th a Walsall - Barmouth day excursion was worked roundtrip by 25261 & 25253. On August 28th the Walsall - Norwich - (for Yarmouth) - Norwich - Derby diagram was worked by 25261 & 25282 as far as Ancaster on the return leg where 25282 failed, both locomotives were replaced at Nottingham by 46004. The next day (29th) 25261 & 25282 were still together and worked the relief 09.53 Nottingham - Skegness, only the outward leg was handled. On August 31st 25261 & 25321 worked the relief 09.53 Nottingham - Skegness and the return 18.15 Skegness - Nottingham. On July 28th 25261 & 25321 worked the Walsall - Norwich (for Yarmouth) - Norwich - Derby diagram. The following five days saw the same pair of locomotives (25261 & 25321) make roundtrips to Skegness from Derby (29th), Leicester (30th, 31st, August 1st, 2nd). On August 4th 25261 & 25280 worked the 08.25 Leicester - Blackpool North forward from Nottingham, returning with the 14.25 Blackpool North - Leicester to Nottingham. Photograph courtesy Roger Geach. 25261 passes Kenilworth on the evening of April 15th with a Banbury - Bescot freight. 25261 was noted at Bescot on May 28th complete with brakevan. The LNER Charter Euston - Aberystwyth roundtrip Wolverhampton - Aberystwyth was worked by 25261 & 25260 on June 1st. The 07.40 Euston - Aberystwyth from Wolverhampton and the return 17.55 Aberystwyth - Wolverhampton were worked by 25261 & 25154 on June 7th. The next day (8th) the same pair worked the 08.45 Birmingham New Street - Aberystwyth and the return 18.10 Aberystwyth - Euston as far as Newtown where 25261 was failed after catching fire and replaced at Shrewsbury by 25130. On August 9th the 12.23 Manchester Piccadilly - Paignton was worked forward from Birmingham New Street by 25261 & 25267. The 10.10 Euston - Aberystwyth from Birmingham New Street and the return 16.10 Aberystwyth - Shrewsbury were worked by 25261 & 25139 on September 20th. 25261 was withdrawn on January 4th 1981. Withdrawn with both tablet catcher recesses present. Page added June 24th 2012. Last updated March 9th 2019.